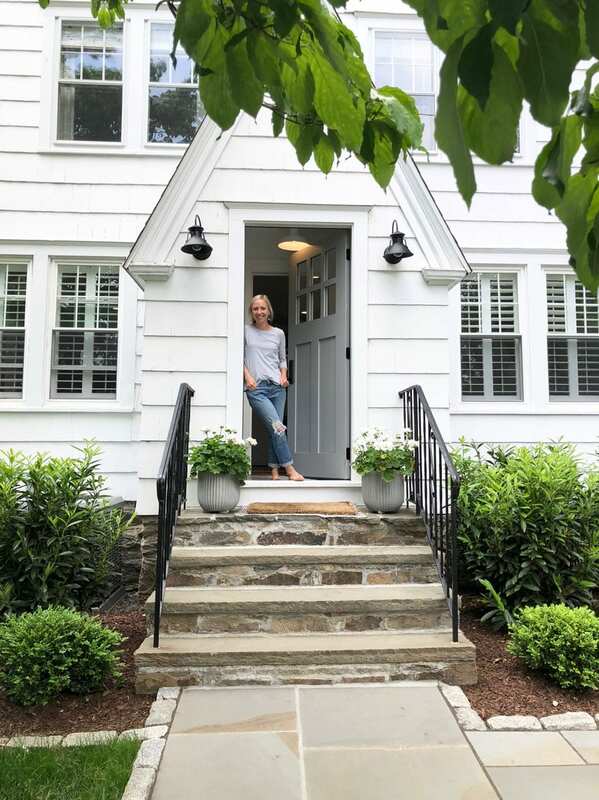 This month’s Project Design is all about curb appeal. 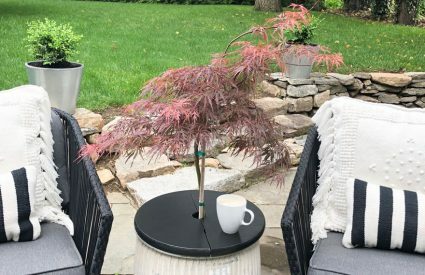 I’m joining Mary Ann of Classic Casual Home and Cindy of Rough Luxe Lifestyle along with our guest bloggers, Brooke of Nesting with Grace and René of Cottage and Vine to share our simple ideas on curb appeal. 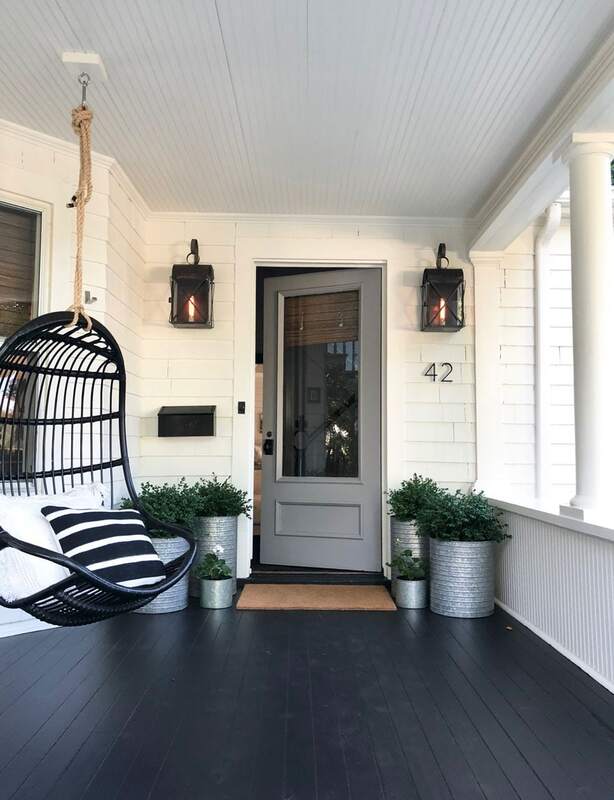 Curb appeal is one of those things that could be as easy as a fresh coat of paint on the door, a new mailbox, house numbers, hardware and some new boxwoods or seasonal flowers in the planters. 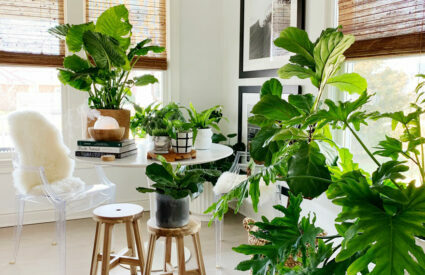 A few little changes to freshen things up and your house will make a beautiful first impression. 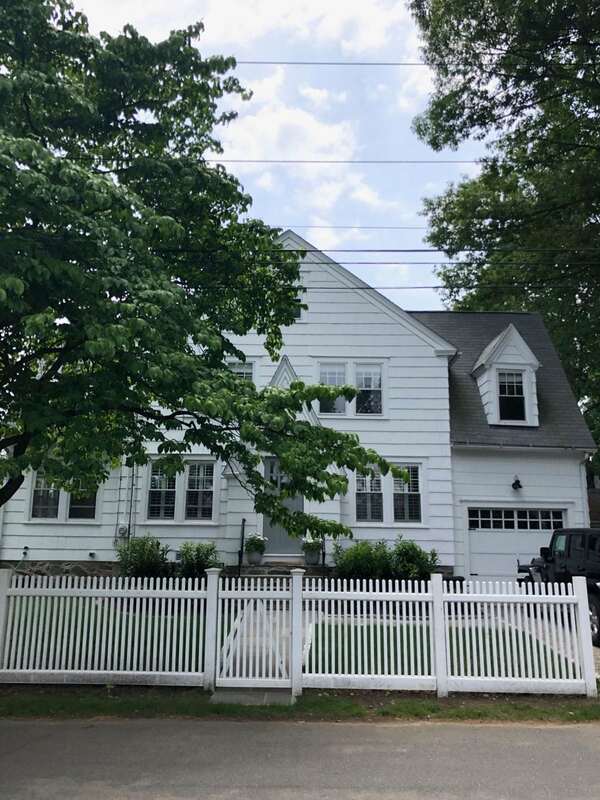 First I am so excited to share Caitlin’s beautiful Connecticut beach house. 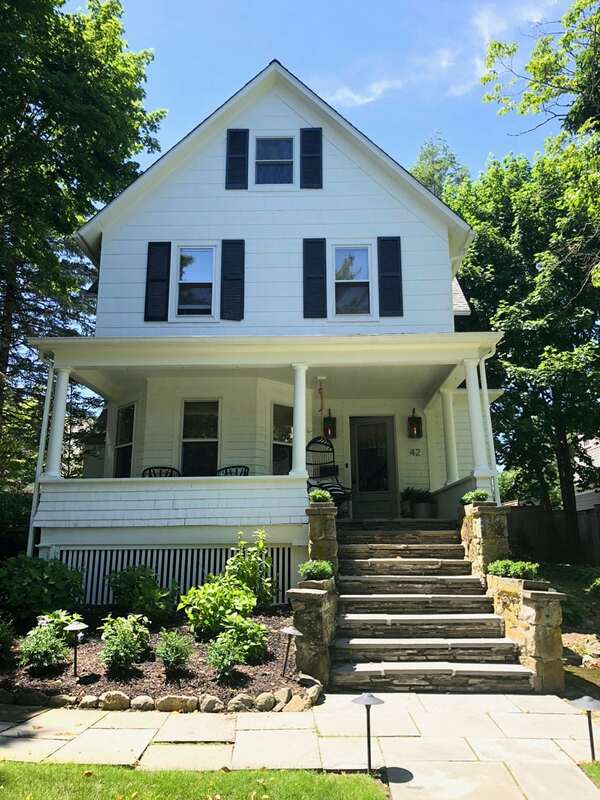 She and her husband have lived in the home for about a year and a half and they have made so many improvements including the curb appeal. Caitlin loves gray and white and so it makes sense that her door is painted the perfect shade of gray. It’s called “Storm” from Benjamin Moore. Her planters are concrete from Terrain and of course she has white geraniums that look so pretty on her stone steps. Just inside her front door they removed a closet and added benches on both sides. You can see her interior here and here. 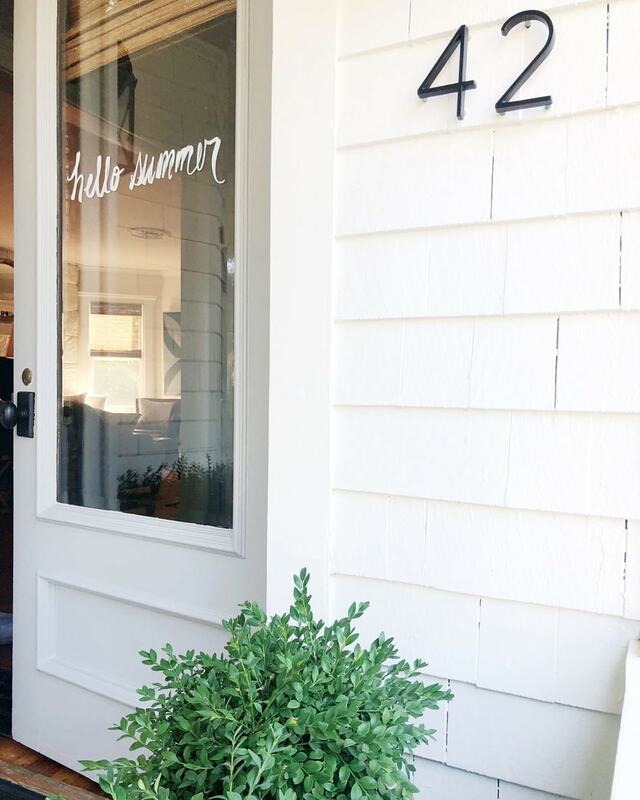 Caitlin has an instagram called The Picket Fence Projects, so naturally adding a picket fence was on the list of home improvements. 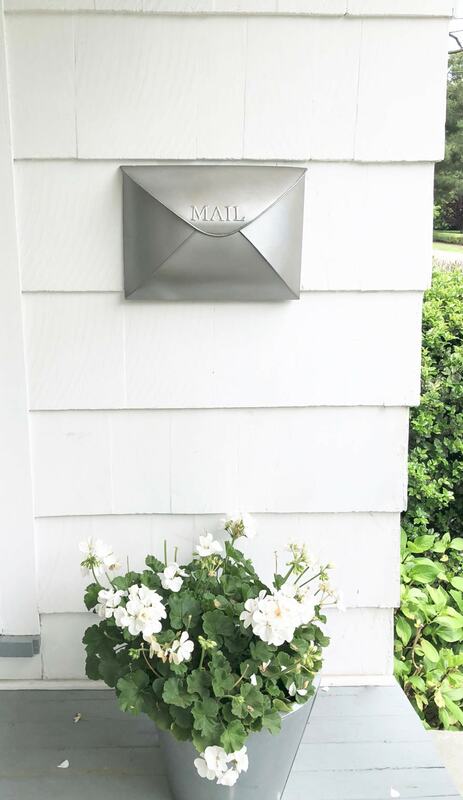 Her side porch with this cute mailbox from Pottery Barn. 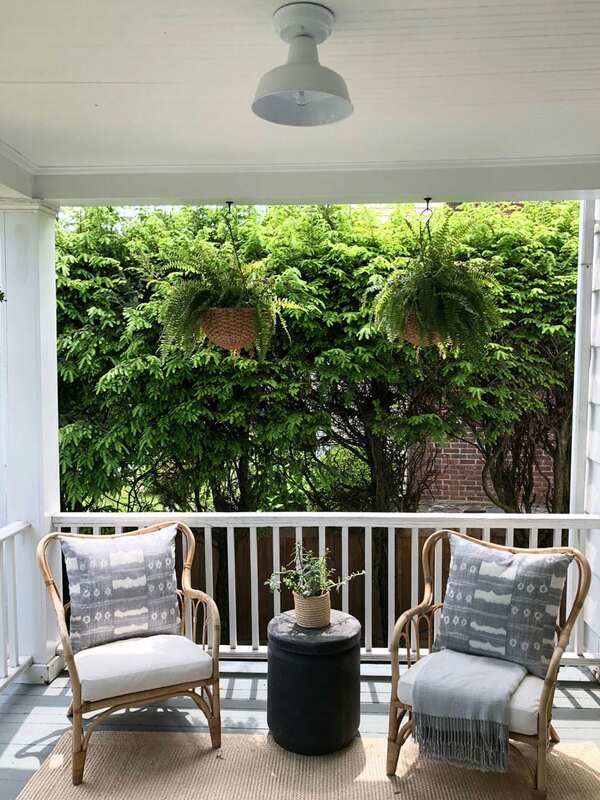 Caitlin took the opportunity to make her side porch look its best with a seagrass rug, rattan chairs from Ikea and a stool she found at TJ Maxx! She has a great eye! She used these hanging baskets for ferns. Curb appeal really just starts with giving your entry and the area surrounding the door a good scrub. A pressure washer comes in handy, but I also just use a bucket of soapy water and a hose. After everything is clean and dry I keep it clean by using a small battery operated leaf blower. I can’t think of a house I’ve lived in anywhere that doesn’t need this every day. Our front door is mostly glass and I write on it quite often with a Sharpie water-based paint pen. In between Sharpie messages I keep it clean with Sprayway window cleaner. The black matte door hardware on the front door as well as our garage is from Emtek. We’ve used Emtek hardware for our last several homes and could not be happier with the options for style, the price and how well it’s made. We’ve used them for exterior door hardware, interior door hardware and hinges as well as knobs and pulls on our kitchen cabinetry. 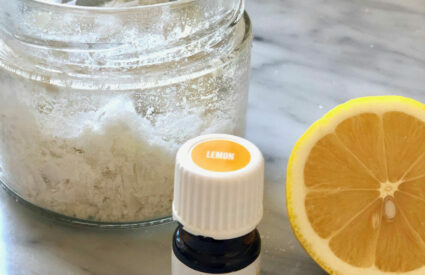 You can see all of their products here. 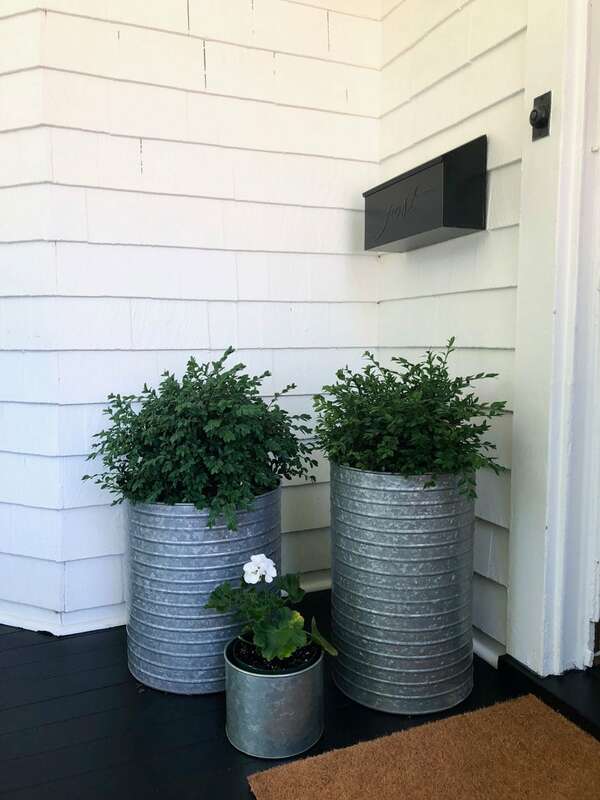 To keep the porch clean from drainage after watering plants, I always use liners inside the planters. That way any of the excess water drains into the planter and not onto the porch creating a mess. Our mailbox is on the porch right outside the door. 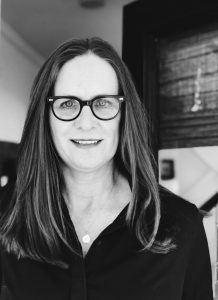 And so is Caitlin’s from The Picket Fence Projects. We live just a few towns apart in Connecticut. 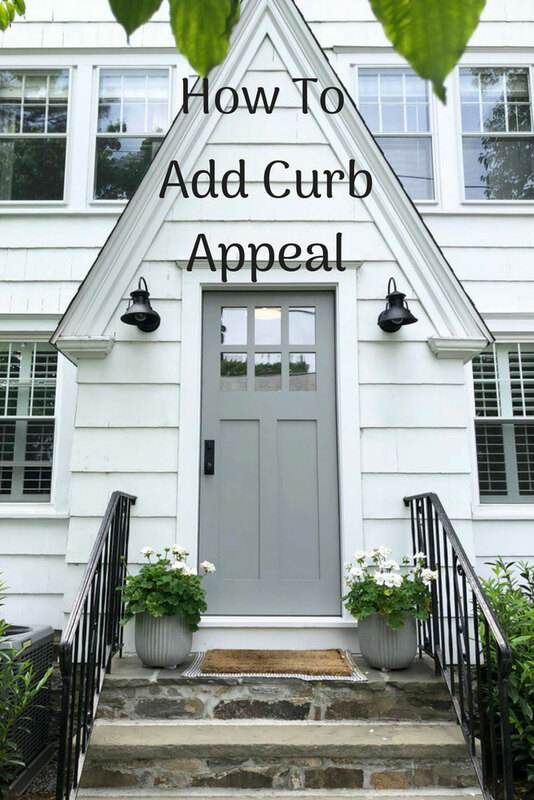 I asked Caitlin if I could share her house for this curb appeal post and she is so generous that not only did she say yes, but she inspired me to change my door color from pink to gray. Since Caitlin has amazing style both inside her home and out, I went with the exact same color. She used Benjamin Moore Storm. We used the same color but had Home Depot mix “Storm” in Behr Paint because we LOVE Behr Paint. We painted our garage Behr Black and it has held up so well. It hasn’t faded and I think it has been at least four years. 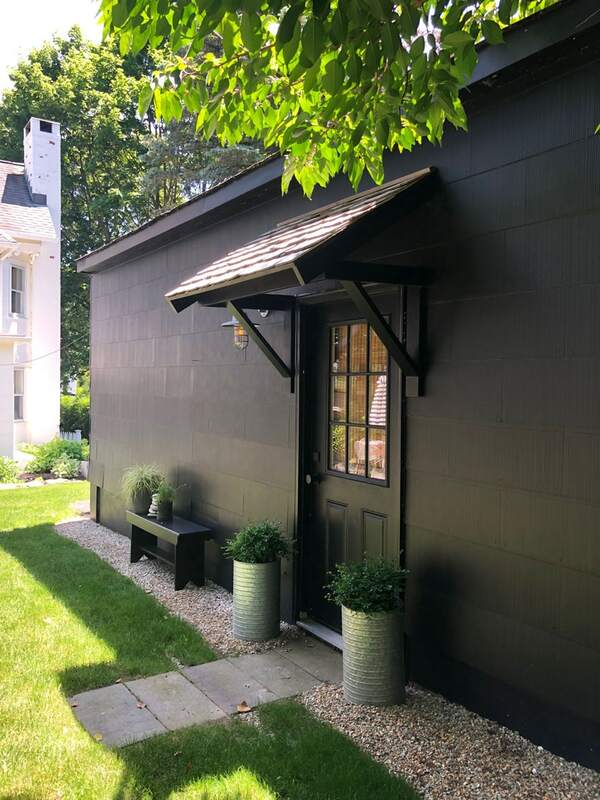 We painted our garage black and added a portico giving it curb appeal! 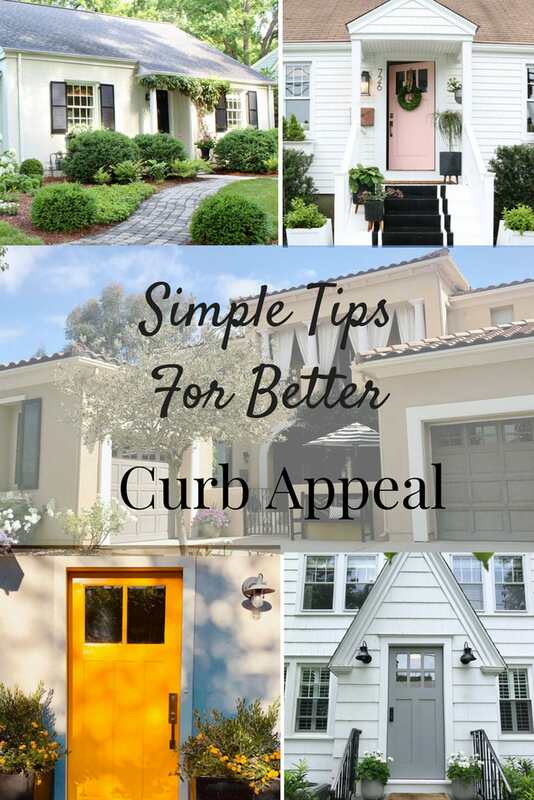 Make sure you stop by these blogs to see more curb appeal! Follow me on Pinterest for more inspiration!